Are sunglass displays only meant for protective UV glasses? While eyewear for sunny weather is commonly placed on these retail store fixtures, summer sunnies are not the only selections that can find a home on the racks. 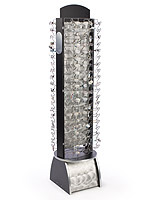 The sunglass displays with easy access designs are all made of durable materials because typically these wood or acrylic eyeglass stands are placed in busy locations. 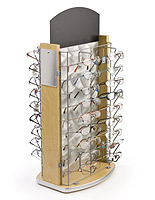 The optical stands are able to display fashion eyewear, prescription frames, reading glasses or other options that help to make vision better for people. 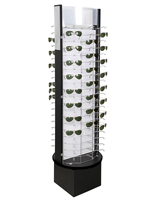 The sunglass displays, called racks for shades, are outfitted with mirrors on the sides of the units or on top. The retail store fixtures have many options for placement, like countertops, floors, or even a model that fits into existing slat wall grooves. 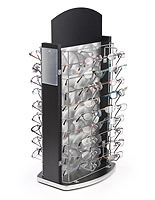 These stylish holders for spectacles are able to showcase multiple selections for purchase instead of just one or two that you have strategically placed throughout your store or those that are under lock and key in your showcase. What materials make up these lasting holders for reading glasses? 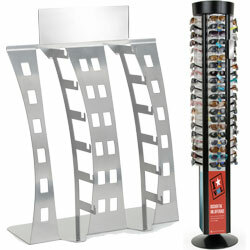 These sunglass displays are constructed from materials that are not only strong, but that look great too. These racks may be covered with melamine paneling in black or maple and incorporates metal panels and supports that coordinate well with the countertop or floor rotating stands. These holders may also be made of metal, steel or aluminum, possibly with plastic or wood pieces for more modern looking eyeglass stands. 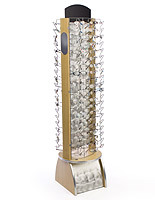 These retail store fixtures come in stationary and rotating styles and one even features sign holders at the bottom of the pedestal. 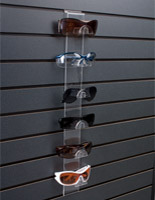 One of the more interesting sunglass racks that we offer is a slatwall mount that is made of acrylic. This clear plastic unit holds 6 pairs of glasses and saves counter and floor space by attaching to walls. The transparent display is able to show off fashion glasses without distracting from the look of the frames at all! These racks are ideal for many different locations and businesses. Of course holders like these are seen in stores that sell eyeglasses or optometrists offices that can fit prescription lenses to certain frames. These commercial locations want to offer as many choices to clients as possible in order to ensure a sale. What that means is that the rotating choices are a great choice because they can showcase a number of glasses at the same time and do so in a small amount of space, whether that is on a counter or floor. 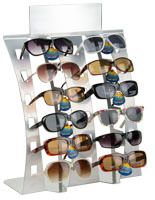 Retail department stores, clothing outlets, or accessory boutiques are also settings where these sunglass racks are great for use. Customer can match frames to outfits, jewelry, or hats to find the best look for them. Certainly no matter where these static or spinning designs show off eyewear, they will last for an extended period of time!